A new study jointly commissioned by the Morris Leslie Group and Perth & Kinross Council’s investment arm Invest in Perth has set out a range of positive alternative futures for Perth Airport. Consultants Ekos prepared the 40-page report in anticipation of the forthcoming £1.84 billion Tay Cities Deal and the projected £113 million Cross Tay Link Road. The proposed 6km Perth bypass will connect the A9 to the A94 close to the airport. Due for completion in 2023 the new road and new Tay crossing will allow traffic to bypass Perth’s Bridgend district and transform connectivity north of the City, opening up new economic opportunities for the area. 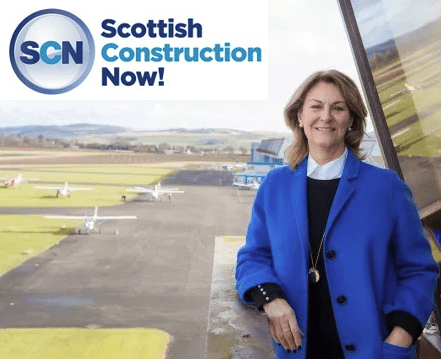 Joyce Leslie, a director of the Morris Leslie Group, whose family company has been a significant local and national employer since 1974 said: “We are delighted to be working with Invest in Perth to secure a thriving future for the Airport at Scone. “This new study considers all options for the future, including our preferred course of developing the site to meet new opportunities that arise. The airport’s owners have submitted comments to the local development plan asking that the airport’s restrictive ‘employment safeguarding’ zoning be removed to allow for a mix of uses to come forward to maximise its future economic benefit under Perthshire’s ambitious development programme. The company believes that the change would allow more flexibility in finding a sustainable future for the airport within the new economic landscape. Perth Airport covers a 45-acre site outside Scone and currently supports 160 jobs. Its flight operations are managed by ACS, and it is home to the Scottish Aero Club, Alba Airsports, and Scotland’s only Charity Air Ambulance, which is capable of reaching 90% of Scotland’s population within 25 minutes in an emergency. The adjacent buildings, many of which date back to the airport’s World War II origins, are currently in residential, hospitality and industrial uses, including business incubators, generating an annual £5.9m in gross value add to the local economy according to the new report. Although airside operations are booming, with a 10% increase in use by aircraft over the last year, the long term commercial viability of the site is in question given the need for extensive investment to maintain its current operations. Morris Leslie has invested around £1.5m over the last five years, and the study estimates that £4.8m more is needed to sustain current on-site uses. The Ekos study seeks to estimate future demand for airport-based activity and assess the current value of the Airport to the regional economy and to estimate how this might change over the short, medium, and long term. These options are measured against a control scenario of ‘managed decline’ in the case of no change being permitted. The assessment has been driven by both strategic and operational challenges and opportunities across the region. Editorial from Scottish Construction Now.